There is a huge quantity of people who love to entertain at casino or simply play different card games at home. According to statistic the number of inspired poker players predominates over the number of gamblers that are keen on some other casino games. In addition, the game of poker draws crowds from all over the globe: Swedish, Indonesian, Brazilian, Australian, American gamblers. Players have a strong desire to win playing poker, and they are ready to use any of working strategy or method to achieve their goal. Thus, naturally cheating at poker is more frequent that in any other casino cheating. There are many methods to cheat in this game that dishonest players often resort to. The most common probably are Marked cards and The Cold Deck. Maybe it's time to use online slots where the cheating possibility is very small and thus you concentrate more on the game. The method of marked cards is also called 'readers'. The main idea is quite understandable - there are some certain cards in the deck that are marked for the purpose to be recognizable. Usually cheaters mark those cards which have the highest value. The Cold Deck is a simple deck of cards that has been arranged before the game and prepared in a certain order for cheater to have perfect cards for the winning. Such deck usually doesn`t require a dealing but sometimes it might be influenced by a false dealing that doesn`t do any damage to the plan. As far as you`ve already know there are plenty techniques of card shuffling and you can imagine that dishonest players consider shuffle to be a perfect moment to cheat in a game. The following methods are generally related to card manipulation mainly because the sleight of hand is widely used in it. This technique often used with an aim to stake a deck if the shuffling over the cold deck is required. Actually it is look like legitimate shuffle but in fact all cards that are "shuffled" just remain to be on the same position in a deck. At the end a cheater gets the desired cards easily. 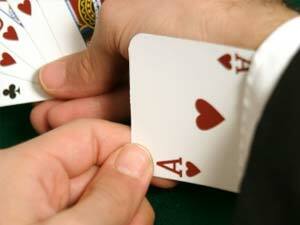 The cheaters consider the overhand shuffle to be the most convenient for this trick as it is the simplest one. The things are much more complicated with riffle shuffle but there are some ways to handle false shuffling in this case. The deck can be already prearranged. In this case the "top stock control" is used and it is really effective. This is also a good method to indicate the cheater in riffle shuffling. We know two ways of the false dealing. The first one is called "dealing seconds" and it means that the cheater`s desired card will be placed on the top of a deck. It will occupy this top position during the whole dealing process till it gets to cheater`s turn. Such kind of sleight of hand is really difficult to perform and much more difficult to detect if it is performed in a proper way.